The Best Fudge Brownies ever (okay, maybe not “ever” but close) are from the back of a bag of King Arthur brand flour, these brownies are excellent! To get really dark brownies I used Hershey’s Dark, but you can use any unsweetened Dutch process cocoa powder. I usually make these in a 9×13 inch pan, but I’ve also been known to halve the recipe and use an 8 inch square metal pan. Another nice thing about this recipe is that while the brownies are rich tasting, they’re made with cocoa powder and aren’t quite as expensive to prepare as brownies made with chocolate. An easy recipe for brownies made with cocoa powder. Preheat oven to 350 degrees F. Lightly grease a 9x13 inch metal pan or line it with foil and grease the bottom. In a microwave-safe mixing bowl, or in a saucepan set over low heat, melt the butter, then add the sugar and stir to combine. Return the mixture to the heat (or microwave for 1 minute) and heat until mixture is very hot but not bubbling; it'll become shiny looking as you stir it. Heating the butter and sugar a second time will dissolve more of the sugar, which will yield a shiny top crust on your brownies. Transfer the mixture to a bowl (if you melted the butter and sugar in the mixing bowl, you don't have to transfer anything).Stir in the cocoa, salt, baking powder and vanilla. Add the eggs, beating till smooth; then add the flour and chips, stirring until combined. (Note: if the batter is still very warm, let it cool slightly before adding the chips, otherwise they will melt into the batter). Increase salt to 1 scant teaspoon if you are using unsalted butter. I usually don’t write reviews for things, but I made these last night and they were the BEST brownies I’ve ever made. I always try different recipes for brownies from scratch. These were fudgy and moist and absolutely delicious. Definitely saving this one! wow these look awesome! I’ve been looking for a good brownie recipe for a while now. cant wait to try these! Nope, they’re not supposed to be melted. I hope yours turn out great! Just putting them in the oven. You didn’t state IF the chocolate chips should be MELTED. I didn’t and hope that’s okay. I kept them out on the counter because mine are usually frozen! They were room temp when they went in. You may have overcooked the brownies or used too much flour. Your batter being very stiff was a signal you used too much flour. The only way to be really accurate with flour is to weigh it. It’s not your fault. Sometimes if it’s humid, a cup of flour is heavier than usual. That being said, this does make a thicker batter than most. Maybe you just didn’t like the brownies. Everyone has different tastes. I just made these because the picture looked so good and I had some of the Hersey’s dark cocoa on hand. I carefully halved the recipe because I didn’t want a huge batch of brownies sitting around for my husband to eat. The batter was much stiffer than other recipes and we didn’t like the brownie texture. Any ideas about what I could have done wrong? Thanks! Thanks for recommending this recipe. I finally made them this weekend and I think they are definitely the best brownie recipe I’ve tried (or at least tied for best). So easy and so delicious. I’ve tried to make brownies from scratch numerous times, but they never come out good. This brownie recipe is amazing. Everyone asked me for the recipe and I plan to use this recipe many times in the future. I’m about to try your best fudge brownies ever recipe, and I was hoping you could answer a quick question for me. If I lightly grease my (metal) baking pan, do I still need the parchment paper? Or is the parchment paper a way to avoid the greasing of the pan? Sorry for the silly question. I’ve only recently begun to enjoy brownies, and I’ve fallen in love with your Outrageous Oreo Brownies! Oh so very good! KA always has great recipes. Thanks for commenting, Jennifer! Also, thanks for the tip on cane sugar. I’m out and need to get some more. Thank you so much for putting this online! I’ve bought KA flour and not noticed this recipe. I realize this is an old thread, but in case anyone else stumbles across it like I did I thought I should say that – due to a lack of chocolate chips and a strong desire to make brownies immediately – I left them out of the recipe. Caitlin was wondering if that would work, and I can say that it certainly does. I also used half cane sugar and half brown sugar, and I love the results. This recipe will be used many many times in the future :). As a side note, I love the premise of your blog! Thanks for trying some of the recipes from here :). Feel free to take out the chocolate chips. The brownies are very chocolaty without them. That’s cool that you come from a family of brownie purists. They must really know what they like. These brownies look amazing……Unfortunately, my family are brownie purists and don’t like choc. chips in their brownies……Will I be able to do these without the chips, or would that mess up the chemistry somehow? Great recipe! I always make brownies for the last day of school for the kids… this will be made tonight and gone by morning! Thanks for the comment! I am so happy you liked these too. BTW. Albert and I emailed and it turns out he was using a glass pan. When using a glass pan, always reduce heat by 25 degrees F.
These are soooooo yummy! I am on a diet but have had a craving for a few weeks and had to finally give in. I used Ghirardelli Dutch Processed Cocoa and I used a cup of milk chocolate chips just for something different. These are fantastic! I had the same problem as Albert so just kept a close eye on them while extending my baking time. My brownies are lighter (in color) and thicker than those in the photo. I was worried about the middle but for the first try I am very pleased! I am going to try them out on some friends tonight. I am a Trojan but the Longhorns are . . . well done, to say the least 😉 (kidding)! Thank you for such a great site! I think your suspicion is correct and that your oven does not regulate the heat correctly. If the edges are cooking but the insides are under-done, it means the oven is probably too hot. One thing that might help solve the problem is to the lower the temperature by 25 degrees and cook for a bit longer or until the brownies test done. You might also want to buy an inexpensive oven thermometer. If that doesn’t work, it might try using a different pan. Glass pans absorb more heat, so if you are baking in a glass pan, you’ll also need to lower the temperature. This is a fantastic recipe!!! I only have one problem, which I hope someone will help me out with. It has to do with the ovening part, i follow the instructions as per the recipe, the temperature and the timing to the dot, but my brownies or other cakes for that matter, always come out too cooked around the edges and undone in the middle. Can someone tell me if it’s possilbe my oven temperature does not regulate the heat correctly and I should lower or rise the temperature? I saw this recipe on the back of the flour bag, and taped it to my refrigerator. These brownies are very good. King Arthur will never lead you astray. Oh Wow! And, now I see they’re in your Top 10! How did I miss these!? I think I was so in love with some of your other Top Ten choices that I skipped these. Late last night I decided to make brownies so my son would have a dessert for his lunch today. I noticed this recipe on the back of the KA Flour, had all of the ingredients, so decided to give them a try. They’re very good brownies but I can’t help but think that I either overbaked them or put in too much flour. I tend to think the latter. Still… they really are excellent. Knowing that you have referred to KA products before I decided to search your blog to see if you had made these. I had to LOL when I saw that you have 34 brownie entries. Go Anna!! I will definitely make these again, but I think I’ll use my husband’s postal scale and weigh the flour next time. It’s very dry here right now due to severe cold, and the furnace running non stop so that might be affecting how the flour measures. My husband and son love them, for whatever that’s worth. Thanks for the vegan update. I’m going to give it a try. Instead of margarine, I’ll probably test with Earth Balance Buttery Sticks. Jackie, thanks for the link. I like that blog. The brownies look great. My family thanks you for all the baking I’ve been doing recently. When I saw this recipe for “Roses” I thought this might be something you would like to make. http://www.bloggingmakesyoufat.blogspot.com/ It is on November 14, 2006. They are so pretty and might be cute for Valentine’s Day or a tea party or something. Wow, salt dough! Sure sends me back to grade school when we had to make those darn world maps! tee hee! Looks like you had fun! Your such a great mom!! The brownies look supremo darlin’! You know, I think I have put on 10 lbs. since I started using your blog!! I DON’T MIND! Worth it! I like be the first taste tester, a tough job but somehow I do it!! tee hee!! MMMMMMMMMMmm can’t wait to try out those brownies. I thought the longhorn was a set of ovaries at first. Loved the colour of them though! tg, what cocoa would you use? The Hershey Dark worked out well, but these were intensely dark chocolate brownies. I liked them, but I need to get a review from more objective parties. I’m freezing them and will be serving them in the teacher’s lounge on Thursday. I won’t make a big deal of them, but rather just leave them there with all the other Teacher Appreciation Week desserts. Anonymous, thanks for your compliment. Claire, Fuzz is feeling better. She’s been feeling good, but her coughing was so bad it would have disrupted the class. She’ll be fine tomorrow. Sorry Fuzz feels coldish today – I think this is a nationwide thing! 🙂 The brownies look great…nice and fudgy the way I like them! 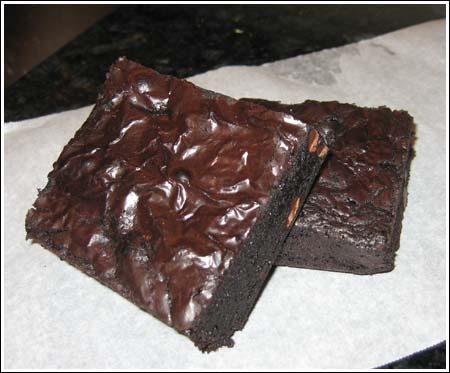 These are the usual brownies that I make – I will have to try the supreme brownies that you mentioned. If I could just reach into my computer screen — that picture of the brownies looked sooooo good. If you put them in the mail, you may want to send them un-cut. They are pretty fudgy. I think if you send them uncut, or maybe cut into two big squares, they will stay fresher. Well, ya know, that Texas Longhorn your daughter made got my attention!! lol She did a great job! Now about those brownies, I am making these tomorrow to put in the mail to the grandkids! Thanks!! wow what timing; i’ve had a major yen for brownies. for some reason, with brownies, i always think “mix” (specifically, duncan hines). i think that was the first thing i ever baked. anyway these look fab. as usual. That was a typo. It is now corrected. About your note after the ingredients…. do you mean unsalted butter? Love your blog!